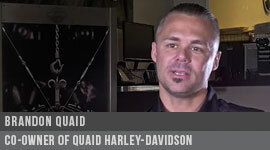 word on liability for your motorcycle accident. 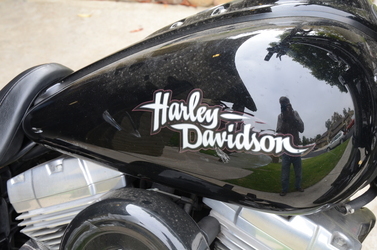 A California motorcycle accident lawyer like Susan Handel can look deeper. Susan Handel focuses her practice in helping victims who have been severely injured or killed as a result of motorcycle accidents. Susan Handel has the experience, resources and knowledge to handle large, complex and difficult cases, while at the same time maintaining the compassion and understanding to recognize the significant impact these cases have on her clients and their families. Susan Handel is widely regarded as an expert personal injury attorney with a record of very successful results for her clients who have been involved in motorcycle accidents. Susan Handel has a staff that will do everything possible to get her clients through the physical, financial and emotional challenges they face after a motorcycle accident. Susan Handel hires the best experts, and utilizes the most current technology in order to give her clients an advantage over the opposing insurance company. Susan Handel will recognize the unique circumstances involved in your motorcycle case and ensure that you will receive the superior compensation that you deserve. All too often due to facts surrounding motorcycle accidents, the motorcyclist is held liable for the incident even though it was not their fault. Motorcycle accident cases challenge Susan Handel to overcome the often unfair myths and prejudices many have against motorcyclists. Motorcyclists have the same rights and privileges on the road as other motorists. 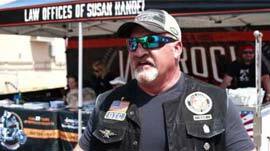 Susan Handel is absolutely committed to protecting the legal rights of riders who have been injured by the negligent actions of others and will defend you aggressively against the unfair accusations of the other driver’s insurance company. Because of the lack of physical protection offered on a motorcycle, the injury sustained will often be more serious and complex, requiring expert medical recognition and evaluation. Susan Handel has access to the country’s best medical experts. For those in need of medical assistance, Susan Handel can provide excellent medical referrals at no up-front cost to you. When a motorcyclist is involved in a collision with an automobile or truck, the result is almost always a catastrophic injury or fatality. Because motorcyclists do not have the impact-reducing shell that automobile drivers have to protect them during accidents, motorcycle riders are at an increased risk for severe injuries. Additionally, motorcycles are not equipped with safety features such as seatbelts and airbags. This results in riders suffering extensive injuries as a result of being thrown from their bike and colliding with another vehicle or the hard asphalt. Motorcyclists traveling at high speeds with little to protect them from the hard asphalt or another vehicle in the event of an accident are very vulnerable to severe injuries such as traumatic brain injury (TBI), disfigurement, broken bones, road rash, spinal cord injuries, and even death. Road rash is one of the most common injuries suffered by motorcycle riders. Failure to wear a helmet makes motorcyclists particularly vulnerable to traumatic brain injuries, or TBI, in the event of an accident. TBI is a serious brain injury that can affect personality, speech, cognitive thinking, motor skills, and all abilities. Many patients with TBI are no longer able to work; most of those require full-time care and suffer extreme financial hardship as a result of the mounting medical bills. The emotional trauma resulting from such a brain injury often affects the victim’s family as well. 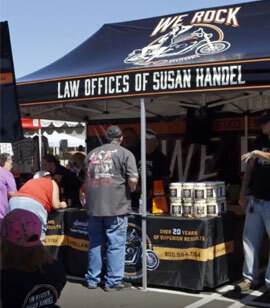 Contact Susan Handel, a trusted California motorcycle accident lawyer. The Million Dollar Question – What’s My Case Worth?